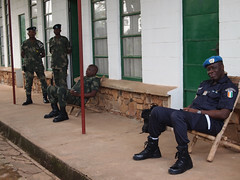 At the same time I was in Kasongo with the Military Court, the civilian court was also there to run criminal trials. 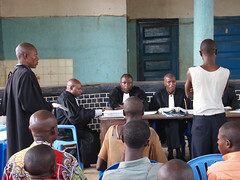 This photo shows a man charged with sexual assault standing before the court. As my friends and I would sit in Place John, we continually admired the hard work of the bicycle man. 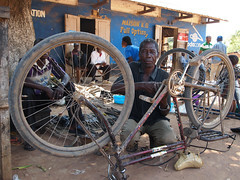 Bicycles are an important part of life in Kasongo. And since people have next to no money, they must keep fixing and fixing their bicycles. A new one is not an option. 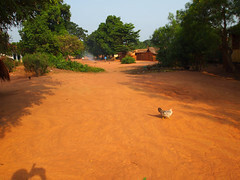 Although the second largest “city” in Maniema province, Kasongo lives, eats and breathes like a village. These are a few photos taken while there in early June. In poor countries the distance between two places is measured by the time it takes to make the journey, not the actual distance. Then, if it rains, distance is increased by a lot. 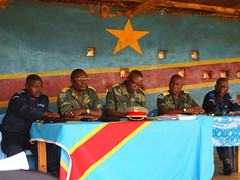 The Congo emphasizes that. 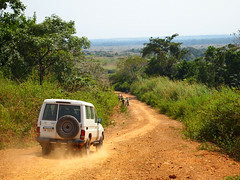 Here are some photos of one of those roads.